A wave is a periodic disturbance that propagates in space which transports energy and momentum from one place to another without the transport of the medium. There are broadly two different types of waves. The wave which is in need of a medium for propagation is called a mechanical wave and the wave which is not in need of a medium for propagation is called non mechanical wave. Non mechanical wave is also called as electromagnetic waves. Electromagnetic wave doesn't demands a medium for propagation and it is not going to affect the medium in any manner while it is travelling through it. Light is a simple example of electromagnetic wave. Light travels all the way from Sun to the earth, even though a lot of vacuum that is there because it’s an electromagnetic wave. A mechanical wave is always in need of a medium for propagation for transmission of energy from one place to another place. The medium shall have certain properties like elasticity, inertia, minimal force of friction between the molecules and uniform density. Without these properties, it is difficult for the medium to allow the wave to travel through it. Elastic nature is a basic property because of which the molecules of the medium are going to come back to their original positions after passing their energy to the next particles. Without this property medium cannot propagate the wave. Inertial property is also a similar sort of property because of which molecules always tries to continue their own position when the external forces are withdrawn. Among the molecules of the medium there will be in opposition force and it is called viscous force. This force shall be minimum for the wave motion. Uniform density also helps for a regular flow of the energy from one place to another place in a systematic way. The phenomena of transmission of energy and momentum from one place to another place where no particle of the medium has a permanent displacement is called wave motion. Each particle after receiving their energy temporarily vibrates about its mean position, pass the energy to the next particles and comes back to its original position. Thus this particle is again ready to receive the energy and pass it to the other particles. The particles are coming back to their original position because of the elastic nature of the medium. Mechanical waves can be broadly divided into two categories. The wave which always motion forward direction from the source and never comes back to the source is called as a progressive wave. The wave which is restricted between two fixed points and never goes beyond them is called as a stationary wave. Progressive waves can be further divided into two categories. If the direction of the vibration of the particles is parallel to the direction of the wave motion then the waves are called longitudinal waves. If the direction of the vibration of the particles is perpendicular to the direction of the wave motion then the waves are called transverse waves. Mechanical waves can be transmitted through solids, liquids and gases. Through the liquids and gases mechanical waves are always longitudinal in nature. Through the solids they may be the longitudinal waves or transverse waves. 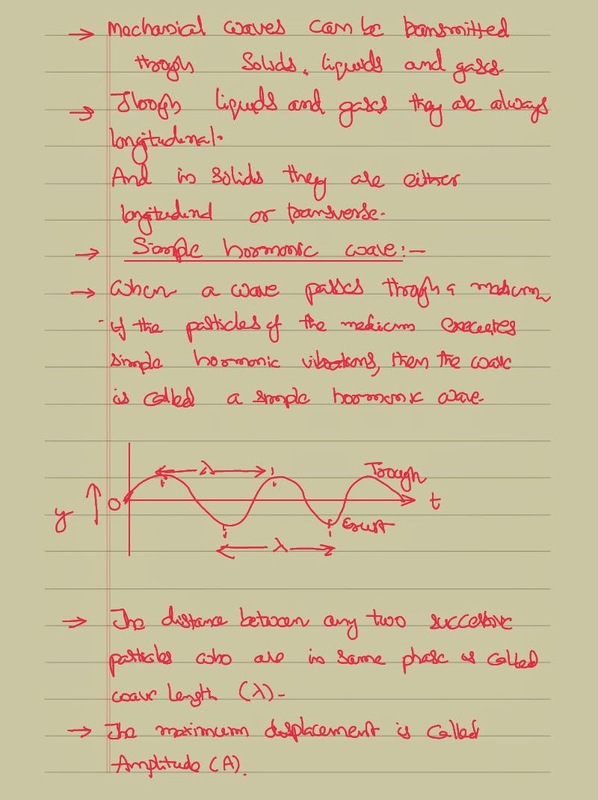 When the wave passes through a medium, if the particles of the medium execute simple harmonic vibrations, this kind of wave motion is called as simple harmonic wave motion. The length of a wave is called wavelength. 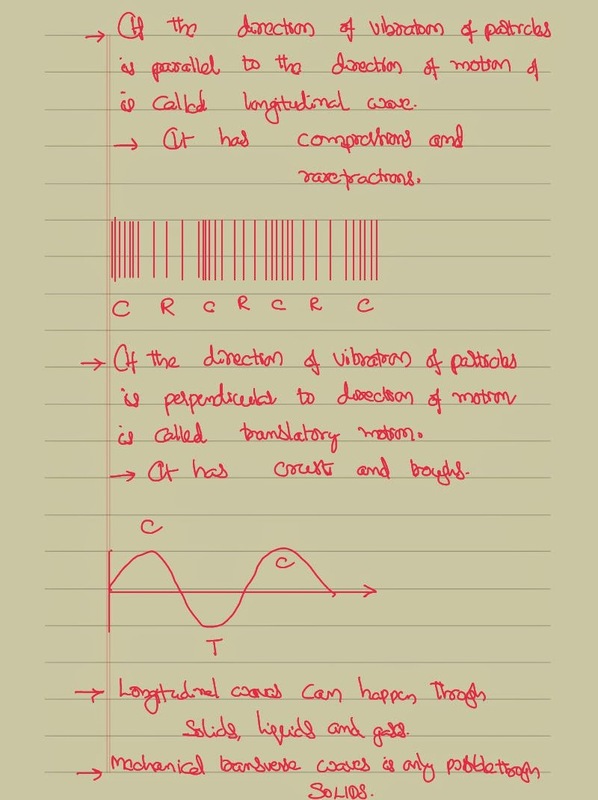 Transverse wave consists of crests and troughs. The distance between two successive crests is also called as wavelength. We can define the wavelength as distance between the two successive points of a wave which are in the same phase. The maximum displacement of the particle during the wave motion is called as amplitude. Phase is the position of a vibrating particle with respect to the mean position. Time period is the time taken to complete one wave. Frequency is the number of th the vibrations made by the particle per one second. Frequency and time period are reciprocal to each other. The distance through which the wave travels in unit time is called wave velocity. 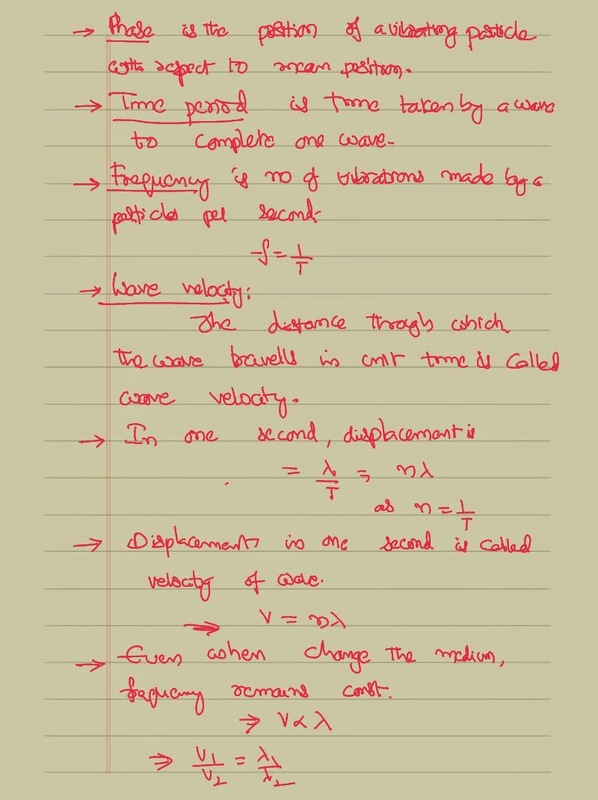 we can derive the relation between where velocity and the wavelength as shown below. It is based on the simple definition. To cover the entire length of the wave, we need a time equal to time period. If the direction of the vibration of the particles is parallel to the direction of wave motion this kind of the wave is called as longitudinal wave. Longitudinal wave consists of compressions and reflections. Compression is a place where the vibrating particles are close to each other and the reflection is a place where the vibrating particles are little bit far away from each other. The distance between two successive compressions or refractions is called wavelength. If the direction of vibration of the particles is perpendicular to the direction of the wave motion then this kind of the waves are called as transverse waves. It consists of crests and troughs.